With the world bemoaning the fact that we are not in a recession any-more but a depression, many would hunker down and sit tight until better time comes - or go under! The other alternative, and a philosophy that I find far more agreeable, is to see this as any challenging situation - a chance for new opportunities. It is in this spirit that there is a meeting of the two doctors in the pleasant environs of Milton Country Park's Cafe Diem (with free WiFi). Doctor Who? Well Dr Andrea Lorenz, who has just started her company Cambridge TEC (short for Technology Export Communication). 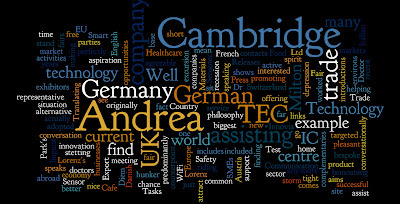 As a linguist (she speaks English, German perfectly, conversationally in Italian, Danish and French) Andrea is originally from Germany and has adopted the UK as her home for the past 12 years, Andrea aims to assist UK technology SMEs in making a market entry into the German speaking world (which includes Austria and Switzerland too). This is a nice counterpoint to my current activities, which is assisting predominantly German businesses find contacts in the UK, so we had a common base. Why Germany? Germany is in the centre of Europe, it is the centre for trade fairs and it is the most active and successful economy in the EU, riding out the storm by actively promoting it's links with markets abroad. Andrea has worked in technology and product innovation, for example with Healthcare, Food Safety, Smart Materials, with companies such as Innovia Technology Ltd., Cambridge IC and Sensotec. With her own company, Cambridge TEC, she is offering targeted and bespoke service from introductions to on site trade fair support. What does this actually mean? Well a recent example was an excursion to Nuremberg, assisting Cambridge IC at the annual Sensor + Test Trade Fair, one of the biggest trade shows in the sector with around 600 exhibitors in 2011. Tasks included Press Releases, assisting in the stetting up of the stand and then being a proactive representative for the company, helping attract interested parties. Andrea Lorenz's Cambridge TEC is "Translating aspiration into Achievement" for her clients. Our current conversation is finding many complementaries with Milton Contact.